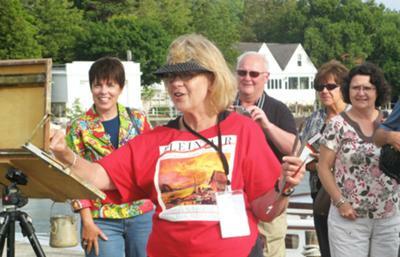 The diverse beauty of Door County, WI (the Cape Cod of the Midwest) will be captured on canvas by 44 nationally-recognized plein air masters during the Door County Plein Air Festival. Hosted by the Peninsula School of Art,in Fish Creek, the festival is the largest outdoor painting event of its kind in the Midwest. Both public and private ticketed happenings bring featured artists together with art appreciators. These opportunities allow participants to not only speak with the artists, but witness the creation of a painting from start to finish. Also, the "Quick Paint" event allows any artist to compete for a spot as a participating artist in next year's festival- or just enjoy painting alongside the festival artists. The festival is very "user friendly" with painting venues easily accessible to the public. The centuries-old villages and varied landscapes are located within a few miles of each other along the shores of the Door County peninsula. Also, Door County has a rich history of maintaining a vital visual arts community. Artists and art appreciators alike are warmly welcomed by residents.